I am such a summer girl, and it always feels a little bittersweet when August rolls around. Even though summer isn't technically over until the end of September, I always associate August with the final hurrah of sunshine-y goodness before the air begins to get cool and crisp here in Chicago. 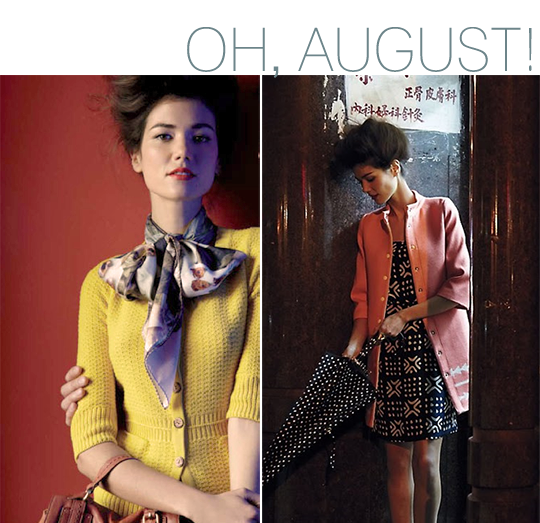 I do love early fall fashion though, and one look at Anthropologie's new August catalog (above) stirred up some excitement in me for things like pretty patterned tights and lightweight sweaters and coats in bold colors. I love that yellow is such a big color for fashion this fall. It's my favorite color, but you don't normally associate it with autumn, which is one of the reasons I chose it for my fall wedding (I like unique!). For me, yellow in the fall is kind of like bringing some of summer's sunshine with you into the colder months. Since August is officially here, I also thought I'd take a look back at some of my favorite posts from the past month. If you missed any of these posts and want to check them out, just click on the images or links. I have so many great posts planned for August, and can't wait to share them with you! And speaking of August, I'm absolutely thrilled with all of the wonderful shops and blogs who are sponsoring Bubby and Bean this month. Make sure you take a minute to visit them by clicking on their buttons in the right sidebar. What about you? Are you excited for fall, or do you wish summer could linger on for a few more months? Check back tomorrow to see who won the Inspired Handmade Giveaway! Can't wait to see what's ahead this month. I am a Fall person so I an anxiously awaiting the end of Summer. Its too hot here in the south! Don't worry though, you've still got 49 more days of summer! I love this recap, there we a couple posts I missed and I just got to read them :-). I am a summer girl as well and don't want it to end either. I like to see the sun! Wow July was a good month. I loved the container garden as well as the teal and turquios. Fall is great, and not just because of my birthday. I look forward to seeing what it has in store this year for us all!! Thanks for the sweet comments everyone! July was a great month and I'm looking forward to an even more awesome August! I've been a little behind on responding to comments this past week with my shower and out of town guests, but I've read them all and am catching up on responding today. I love reading your comments so much, so keep them coming! I can't wait for fall! I hate summer! Also, yellow is my favorite color as well. Good to know it's a fall color this year!